One of our highest priorities is the safety of motorists, pedestrians and cyclists on our roadways. It's part of everything we do, and the reason why you see new types of traffic configurations, signals, signs and lighting systems being put into service in Rhode Island. Our engineers never stop searching for the best solutions to reduce deaths and serious injuries on our roadways. We're building modern roundabouts to make intersections safer across Rhode Island. We are working aggressively to add safety features to reduce the occurrence of wrong-day driving including the installation of detection systems at 24 high-risk areas. 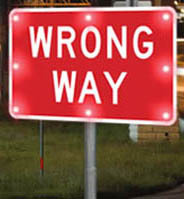 These systems not only alert a driver who traveling in the wrong direction, they notify police and other motorists of a potential wrong-way driver. Accessible sidewalks and street crossings are vital for pedestrians with vision impairments. Accessible Pedestrian Signals communicate information about the time of a crossing using non-visual formats such as audible tones, verbal messages, and/or vibrating surfaces. The Federal Highway Administration has adopted the flashing yellow arrow as a national standard for certain left-turn signals and we're introducing them to Rhode Island. RIDOT has installed a HAWK (High-Intensity Activated crossWalK) traffic signal at a busy pedestrian crossing in Providence and is actively studying other suitable locations. Our HAWK signal is the first of its kind in Rhode Island and New England. We have made numerous improvements to help motorists better see where they are going using the latest reflective materials on our signs and along our roadways. Our traffic engineers serve on the State Traffic Commission, which reviews requests for traffic control devices such as stop signs, traffic signals and roundabouts. The Commission also reviews other traffic and safety initiatives such as crosswalks, speed limit changes, and striping changes. Read about our new initiative for delivering safety improvements much faster than we ever have. 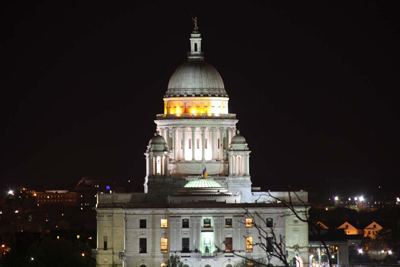 AAA & RIDOT each spring partner to increase motorist awareness of the need to drive carefully in work zones by illuminating the State House dome orange during National Work Zone Awareness Week. We maintain a robust Traffic Research section which manages numerous databases that track crash information, pavement conditions, traffic volumes and speeds, and trucking information. This information satisfies our federal reporting requirements and gives us a clear picture of the health of our transportation system and its users.